Set of 2! Inspired by the famous trumpeting angels at Rockefeller Center in New York City, this outdoor lighted angel will create a stunning effect in your yard as her golden wings slowly open and close. Crafted of shimmery fabric over 300 clear mini-lights, the Animated Angel with Horn will look dazzling both day and night. 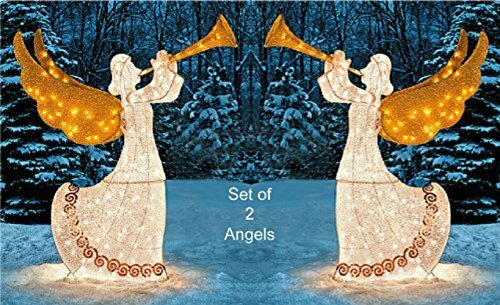 Our outdoor lighted angel includes a sturdy metal stand and dual-pronged stakes to hold her more securely in the ground. Inspired by the famous trumpeting angels at Rockefeller Center in New York City, this outdoor lighted angel will create a stunning effect in your yard as her golden wings slowly open and close. Crafted of shimmery fabric over 300 clear mini-lights, the Animated Angel with Horn will look dazzling both day and night. Our outdoor lighted angel includes a sturdy metal stand and dual-pronged stakes to hold her more securely in the ground. If you have any questions about this product by Holiday Times, contact us by completing and submitting the form below. If you are looking for a specif part number, please include it with your message.